By Rosa Corder, date unknown. Edward Bouverie Pusey was born on August 22, 1800 at the other Pusey House, his father's family seat at Pusey, not far from Oxford. His father was Philip Bouverie (d. 1828), a younger son of Jacob Bouverie, 1st Viscount Folkestone, and took the name of Pusey on succeeding to the manorial estates at that place. 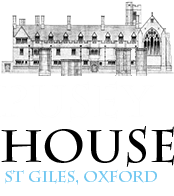 After Eton and Christ Church, Pusey was elected in 1824 to a fellowship at Oriel, becoming a member of a common room which already contained some of the ablest of his contemporaries, and including among them John Henry Newman and John Keble. Between 1825 and 1827, he studied Oriental languages and German theology at the University of Göttingen. His first work, published in 1828, as an answer to Hugh James Rose's Cambridge lectures on rationalist tendencies in German theology, showed a good deal of sympathy with the German "pietists", who had striven to deliver Protestantism from its decadence; this sympathy was misunderstood, and Pusey was himself accused of holding rationalist views. The misunderstanding of his position led to the publication in 1830 of a second part of Pusey's Historical Enquiry, in which he denied the charge of rationalism. In the years which immediately followed, his thoughts turned in another direction. The revolt against individualism had begun, and he was attracted to its standard. By the end of 1833 he showed a disposition to make common cause with those who had already begun to issue the Tracts for the Times. But "he was not...fully associated in the movement till 1835 and 1836, when he published his tract on baptism and started the Library of the Fathers" (John Henry Newman, Apologia pro Vita Sua). In 1828 the Prime Minister - the Duke of Wellington - had appointed Pusey to the Regius Chair in Hebrew. As a Canon of Christ Church and a Doctor of Divinity he added an element of increased disctinction to the fledgling movement in Oxford. 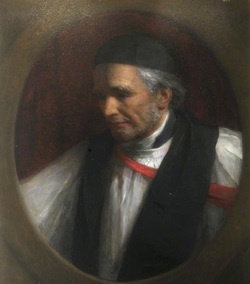 By an unknown artist, late 19th C.
PUSEY became a close student of the fathers and of that school of Anglican divines who had continued, or revived, in the 17th century the main traditions of pre-Reformation teaching. A sermon which he preached before the university in 1843, The Holy Eucharist a Comfort to the Penitent, so startled the authorities by the re-statement of doctrines which, though well known to ecclesiastical antiquaries, had faded from the common view, that by the exercise of an authority which, however legitimate, was almost obsolete, he was suspended for two years from preaching. 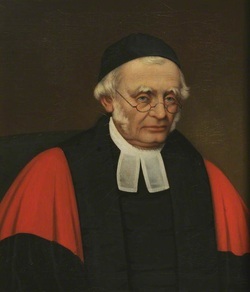 The immediate effect of his suspension was the sale of 18,000 copies of the condemned sermon; its permanent effect was to make Pusey for the next quarter of a century one of the most influential figures in the Anglican Church. The Vice-Chancellor's document of suspension is preserved with pride at Pusey House, where it occupies a place of honour. The movement to which he had been a later adherent, came to bear his name: it was popularly known as Puseyism (pre-1845 it was sometimes called Newmania) and its adherents as Puseyites. His activity, both public and private, as leader of the movement was enormous. He was not only on the stage but also behind the scenes of every important controversy, whether theological or academical. In the Gorham controversy of 1850, in the question of Oxford reform in 1854, in the prosecution of some of the writers of Essays and Reviews, especially of Benjamin Jowett, in 1863, in the question as to the reform of the marriage laws from 1849 to the end of his life, in the Farrar controversy as to the meaning of everlasting punishment in 1877, Pusey was always busy with articles, letters, treatises and sermons. The occasions on which, in his turn, he preached before his university were all memorable; and some of the sermons were manifestoes which mark distinct stages in the history of the High Church party of which he was the leader. The practice of confession in the Church of England practically dates from his two sermons on The Entire Absolution of the Penitent, in 1846, in which the revival of high sacramental doctrine is complemented by the advocacy of a revival of the penitential system which medieval theologians had appended to it. The sermon on The Presence of Christ in the Holy Eucharist, in 1853, first formulated the doctrine round which almost all the subsequent theology of his followers revolved, and which revolutionized the practices of Anglican worship. Of his larger works the most important are his two books on the Eucharist - The Doctrine of the Real Presence (1855) and The Real Presence the Doctrine of the English Church (1857); Daniel the Prophet in which he endeavours to maintain the traditional date of that book; The Minor Prophets, with Commentary, his chief contribution to the study of which he was the professor; and the Eirenicon, in which he endeavoured to find a basis of union between the Church of England and the Church of Rome. PUSEY is chiefly remembered as the eponymous representative of the earlier phase of a movement which carried with it no small part of the religious life of England in the latter half of the 19th century. His own chief characteristic was an almost unbounded capacity for taking pains. His chief influence was that of a preacher and a spiritual adviser. As a preacher he lacked all the graces of oratory, but compelled attention by his searching and practical earnestness. His correspondence as a spiritual adviser was enormous; his deserved reputation for piety and for solidity of character made him the chosen confessor to whom large numbers of men and women unburdened their doubts and their sins. In private life Pusey's habits were simple almost to austerity. Though fierce with his opponents, he was gentle to those who knew him, and his munificent charities gave him a warm place in the hearts of many to whom he was personally unknown. He financed the building of St Saviour's Church, Leeds, and was instrumental in the foundation of Ascot Priory. In his domestic life he had some severe trials; his wife died, after eleven years of married life, in 1839; only one of his daughters survived into adulthood, and his only son, who was a scholar like-minded with himself, who had shared many of his literary labours, and who had edited an excellent edition of St Cyril's commentary on the minor prophets, died in 1880, after many years of suffering. From that time Pusey was seen by only a few people. His strength gradually declined, and he left Oxford to be cared for by the community of nuns he had founded at Ascot, where he died on the 16th September 1882. He was buried at Christ Church in the cathedral of which he had been for fifty-four years a canon, his body being placed in the vault which already held the bodies of his wife and daughters. In his memory his friends purchased his library, and bought for it a house in Oxford, which they endowed with sufficient funds to maintain three librarians, who were charged with the duty of perpetuating the memory of the principles which he taught, the maintenance of the Catholic Faith, and the preaching of the Gospel. Their work continues today.